Lightbulb Mouth Radio Hour: scandalabra, stuntman advice, Trash Can Sinatras, and champagne in a can. 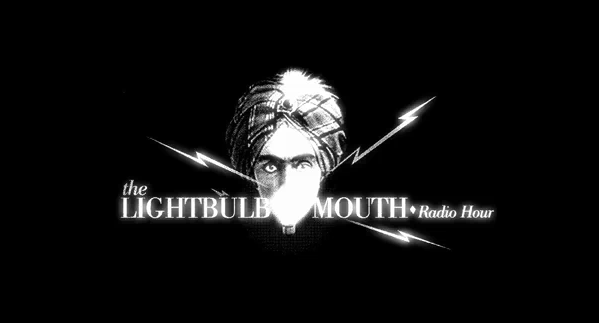 Lightbulb Mouth Radio Hour is neither a swami sideshow stunt nor an obscure homage to the Addams Family’s Uncle Fester but rather, a New Decade incarnation of the tried and true variety show. Plus, it’s a radio broadcast that is really a podcast for those who prefer that sort of newfangled thing. Hosted by Long Beach-bred poet Derrick Brown, the weekly show’s scripted format — musician/interview, “informationist” (i.e. someone who tells you how to do something better than you know how to do it)/interview, author/interview – doesn’t hint at the barely contained, literate mayhem likely to break out at any moment. Past shows at the Basement lounge, the LBC show’s home, have included Comedy Central/Arrested Development‘s David Cross, poet Eitan Kadosh autographing prosthetic limbs, and marshmallows being thrown at the audience. Ms. Go Go hates when she misses the fun stuff. Luckily, this Wednesday’s Lightbulb Mouth Radio Hour promises to be a crackerjack season finale. Brown (who’s opened for The White Stripes and the Cold War Kids and is one of the creators of the recent, smash success Drums Inside Your Chest at Largo at the Coronet) will be author o’ the evening with his book scandalabra. If anyone could successfully interview himself, it would be live wire Brown but his frequent co-host Mindy Nettifee (of Lightbulb Mouth’s sponsor Write Bloody Publishing) will be doing the honors along with Jeremy Radin, Jason Bowe, and Eric Morago so Brown can relax and regale. Scottish band/Morning Becomes Eclectic featuree Trashcan Sinatras will swing by on their short, U.S. tour; add in “amateur stuntman” Buzzy Ennis, who informs on how not to feel pain (Physical? Emotional? Psychic? Only one way to find out, Go Go’ers. ), and the evening is worth so much more than the $7 cover. Plus, there’s a pre-show poetry slam, which will have your head popping whether or not you have the champagne in a can. But let’s not kid ourselves. You will. Senior Citizen Discount before 9PN. ID. Military Discount before 9PM. ID. Next Post Hollywood Comedy Fest: 3 nights of nyuk-nyuk-nyuk PLUS ticket giveaway! I will. It’s true. It’s like you’re looking right through me.